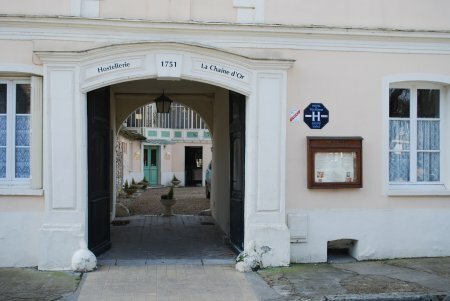 The hotel de la Chaine d'Or means hotel of the golden chain, but it has nothing to do with a chain hotel! This historical mansion has existed since 1751. Its name derives from the chain that used to stop the boat passing on the river. They had to pay a toll before they could resume their journey, the chain proving a real gold mine for the local lord! This atmosphere of old times is still perceptible in the rooms of this quiet stop on the riverside. The setting is absolutely charming. 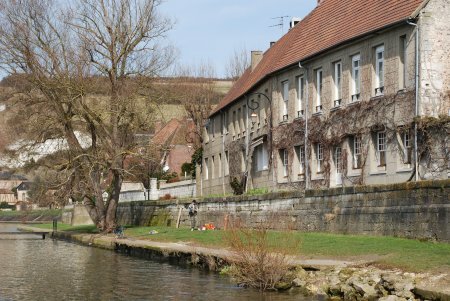 The Seine flows by directly at the foot of the hotel-restaurant, whose other side opens on to the very quaint square of Petit-Andely with its half-timbered houses and its 12th century church. The town is dominated by the impressive outline of Chateau-Gaillard, the stronghold of Richard the Lionhearted. 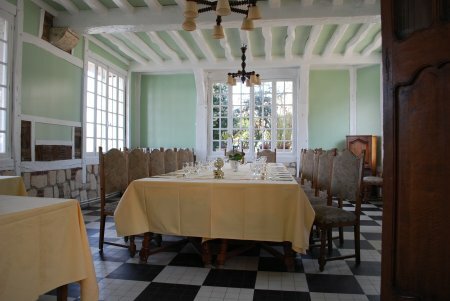 The reputation of the french gastronomic restaurant spreds beyond the limits of the county. To take advantage of the splendid wines carte without reservation, staying overnight in one of the customized suites or bedrooms is the best option. The hotel was a bit neglected for a few years, but it benefits now the loving care of the young couple that has just become its managers and endeavour to restore its prestige. 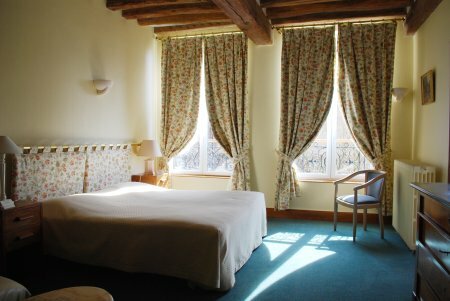 The hotel de la Chaine d'Or is located one hour and fifteen minutes from Paris by car, and twenty minutes from Monet's gardens at Giverny. Chateau Gaillard can be reached after a ten minute walk. 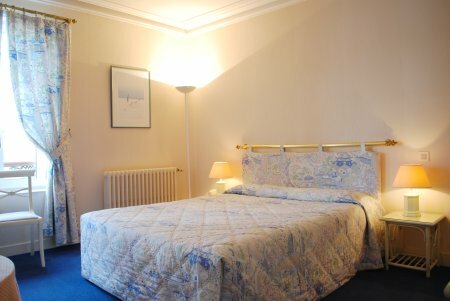 The hotel has 12 customized bedrooms including two suites and two junior suites. All the rooms have views either on the river, on the church or on the garden. Private bath or shower and private toilet in every bedroom, TV set. 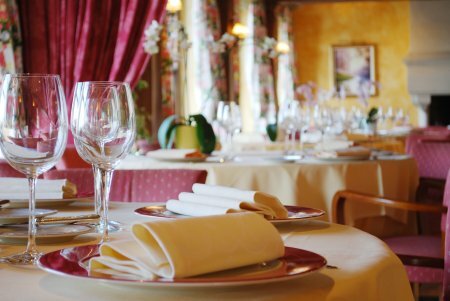 During the season from April to October, people who stay overnight at the hotel are kindly requested to dine at the restaurant. Warning: On wednesdays, the hotel reception desk is open only from 5:00PM to 7:00PM or on special appointment stated by advance. 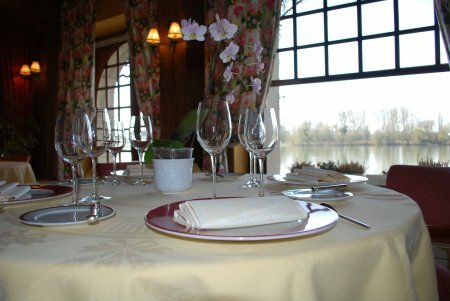 The delicious restaurant is the first reason to come to la Chaine d'Or! Treat yourself with an outstanding and very romantic lunch or dinner. The new young Chef works with the best products Normandy has to offer to create subtle flavours: it is one of the best restaurants in the area of Giverny indeed. Service is anxious to please, and the decoration of the dining room has kept a countryside simplicity, wether the logfire crackles in the fireplace or the windows open on to the barges passing quietly by. During the season, from April 15th through October 15th the Restaurant is closed on Wednesdays. From October 15th through April 15th it is closed on Sunday evenings, Tuesdays and Wednesdays. La Chaine d'Or also welcomes Groups in a private atmospheric dining room. Please ask for more information.